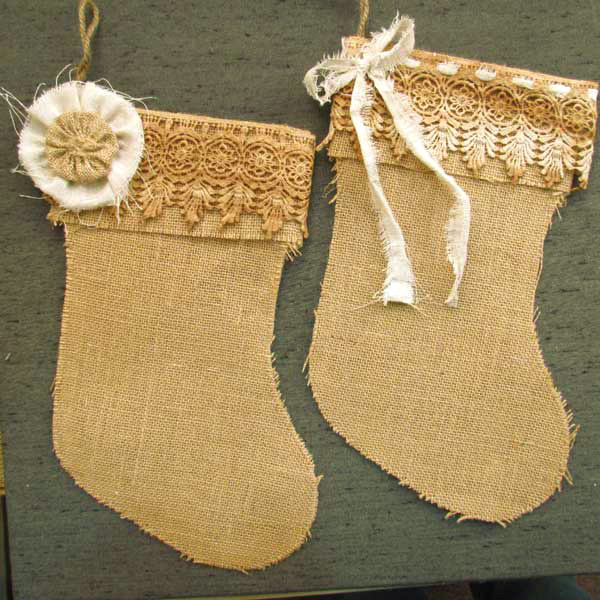 I’ve been looking at these Simple Burlap Stockings in the studio for quite some time now thinking what a great canvas they would be for Christmas colors. Last weekend I finally found some time to “play” with the stockings. 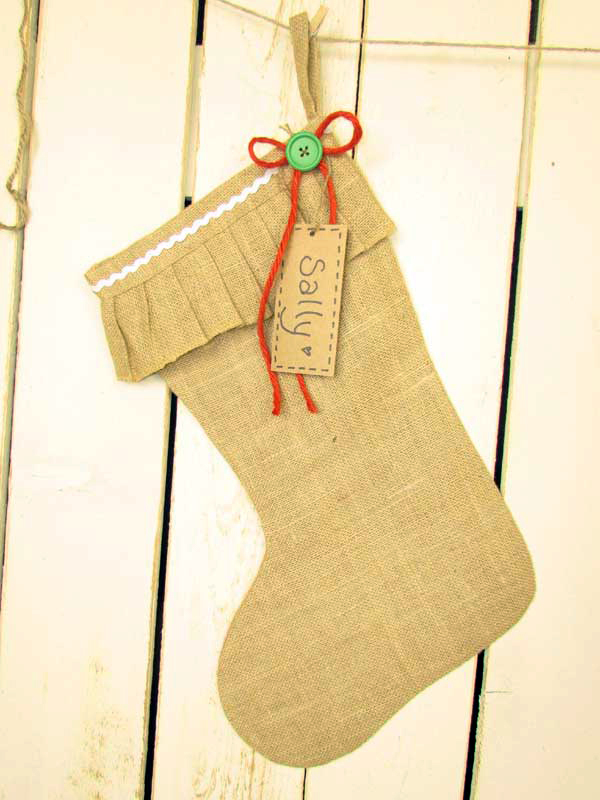 When you start with a basic element like the Simple Stocking, the majority of the work has already been done for you. 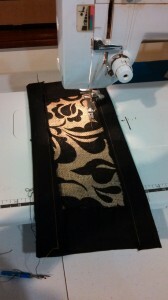 You can just jump right into the fun part of embellishing! 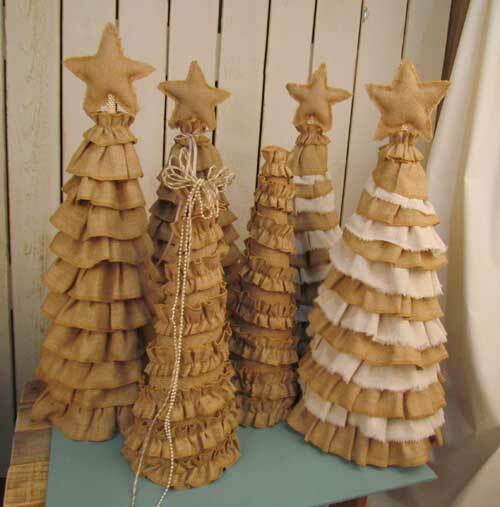 This is especially good if you want to make a variety of similar but different products to sell as a craft. 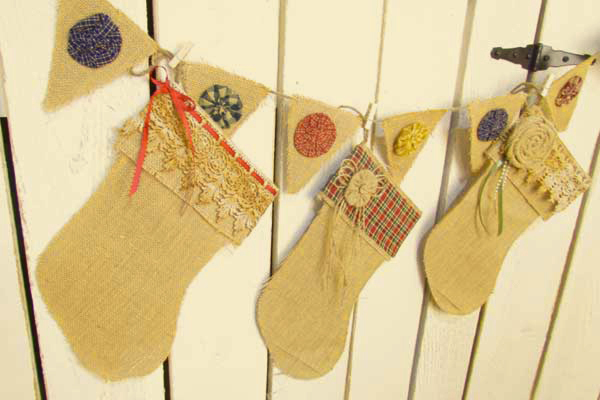 The stockings I made will be placed in a local craft store and hopefully finding new homes before Christmas but I wanted to show them to you here and maybe inspire you to get your Christmas craft on! 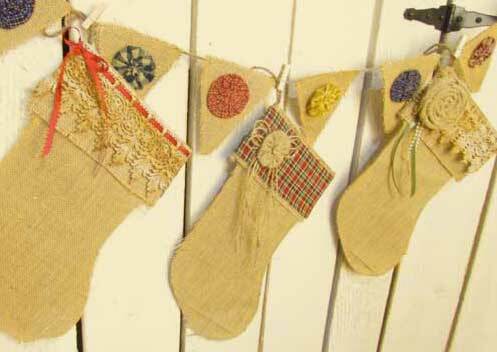 I’ve in love with this tea dyed vintage style Venetian lace that we have now so I used it on most of my stockings. 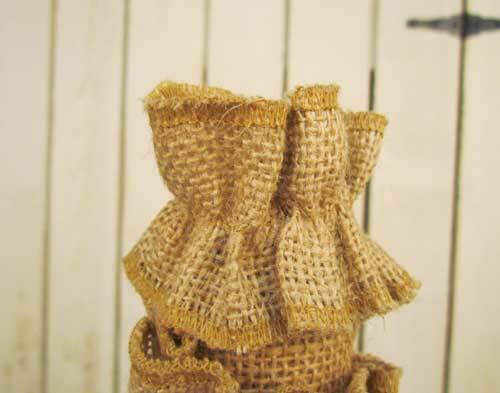 I think the soft, elegant but shabby style of the lace is a great combo with the rougher, rustic burlap. I also used homespun yoyos, ribbon, and fabric to create a variety of different styled designs. 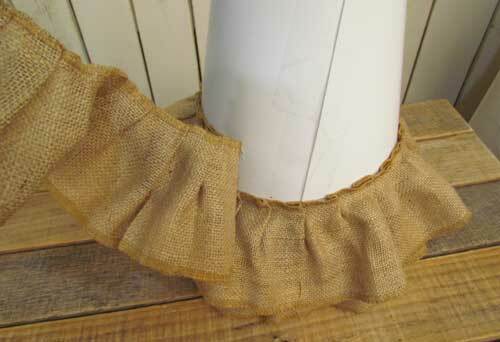 Today I took a good look at our Ruffled Burlap Stocking and decided maybe it could be a good canvas also. 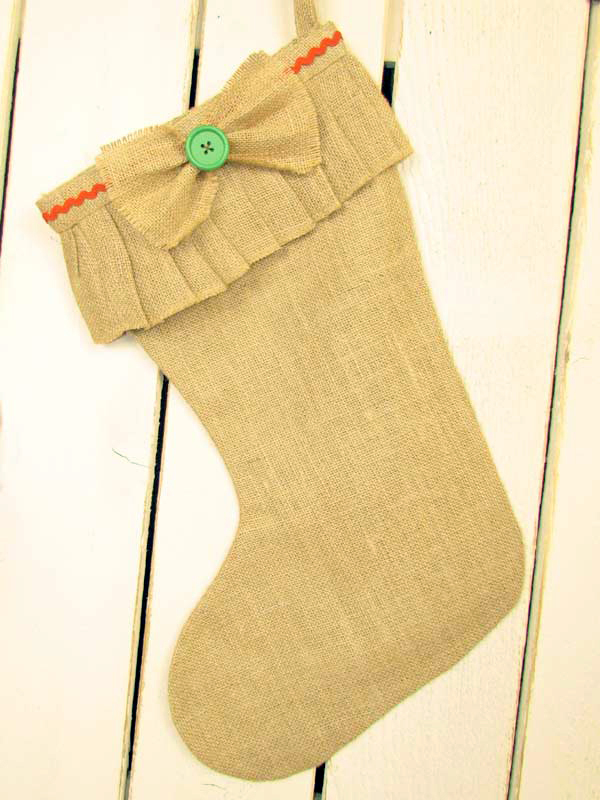 The oh-so-cute ruffle at the top of the stocking seemed to give it a more playful attitude so for this stocking, I embellished with our new Christmas color wood buttons, brightly colored rick rack, fabric, burlap flowers and jute string. No two are the same which is what made this project so fun. 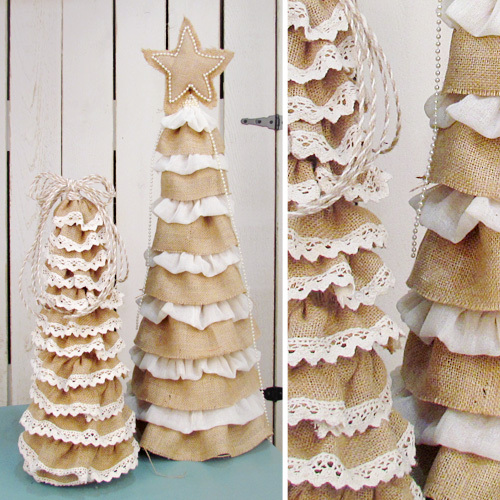 Using the pre-made burlap stockings as a canvas for embellishing is what made these crafts super quick and easy. 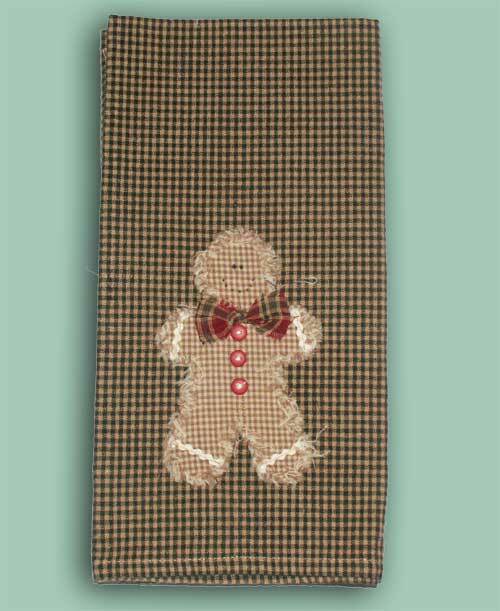 These stockings are great for family craft night yet they are economical enough to sell them at a craft show for a little Christmas cash. If the Christmas craft bug has you now, make sure that you are on our mailing list. 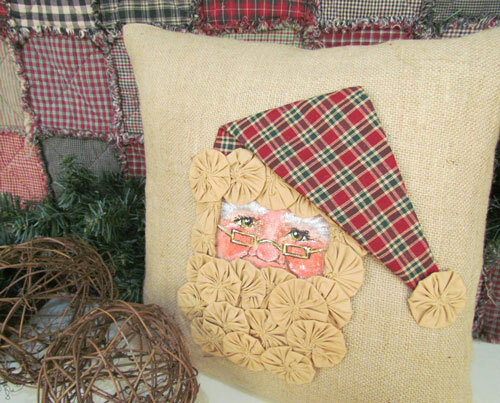 Stefanie is planning some Cyber Monday specials in the Homespun & Burlap Christmas category this year. 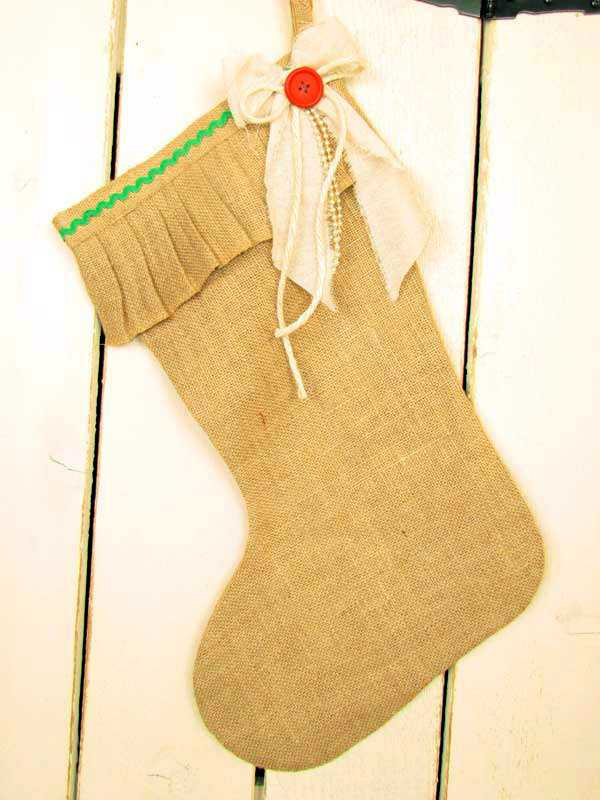 So plug in a little Christmas music, grab some hot cider and tour my embellished Christmas stockings. Enjoy! 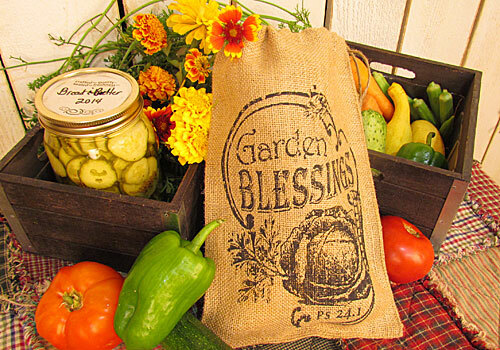 Did anyone plant a garden this year? 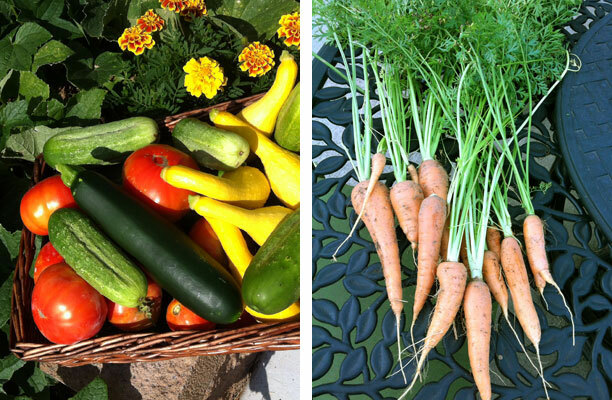 Hubs and I both have parents that have always delighted in growing veggies each summer and they loved sharing the fruit of their labors with friends and family. We, however, have never really been able to grow much of anything. Truth be told, we probably just never really gave the garden our full attention as it requires. However, this year was our first year with an “empty nest” and thus the garden became a very welcome focus. 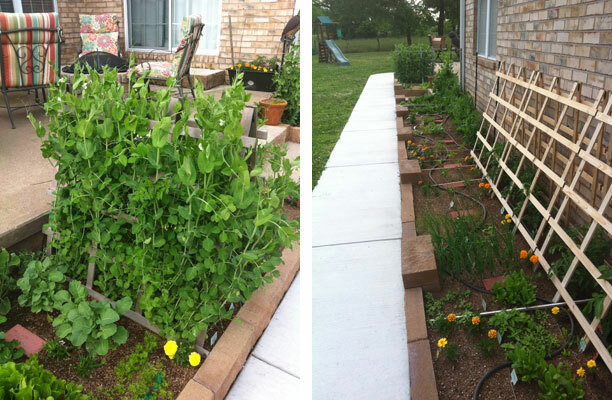 We took the simple route and created some raised bed gardens around our house which had little or no landscaping. We’ve enjoyed seeing the foliage develop although we probably got a little carried away with some of it. I think next year will spread out our plants a little more. 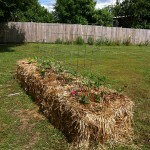 But the most fun thing that we did was creating a straw bale garden. Yes, straw! A friend told us that we could line up straw bales (not hay but straw) side by side and put a metal cattle panel in between them as a trellis. 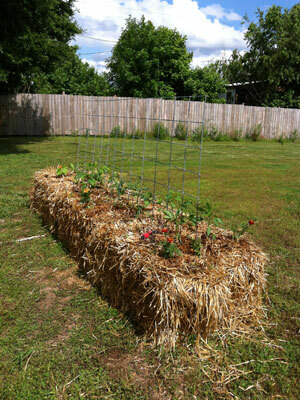 The straw holds the trellis in place without an additional support. We watered the straw for 1 week and fertilized twice during that time. 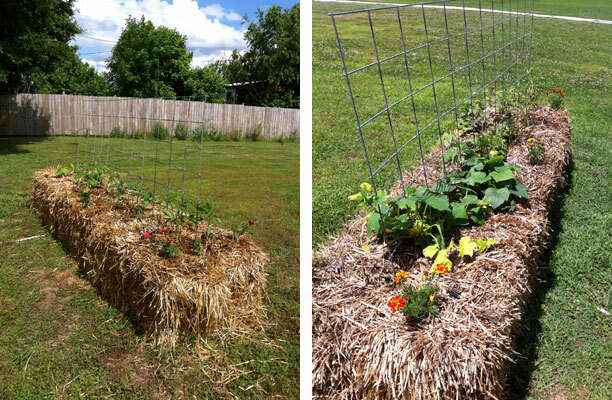 Then we planted tomatoes, cucumbers, sweet potatoes, pumpkins, sweet peppers and marigolds in the straw. No dirt. We just pushed the little baby plants right down into the straw. Then we just watered the straw when we watered the rest of our gardens. Yes, the garden grew and we had some nice produce grown in STRAW! :-) Who knew…. The sweet thing about this style of garden is that it can be done anywhere that you have sunshine and a little space. The soil can be poor or rocky and it doesn’t matter because your plants never contact the soil. You can even do this on a driveway or concrete if you have space. If you don’t like your location, you can place it somewhere else next year. 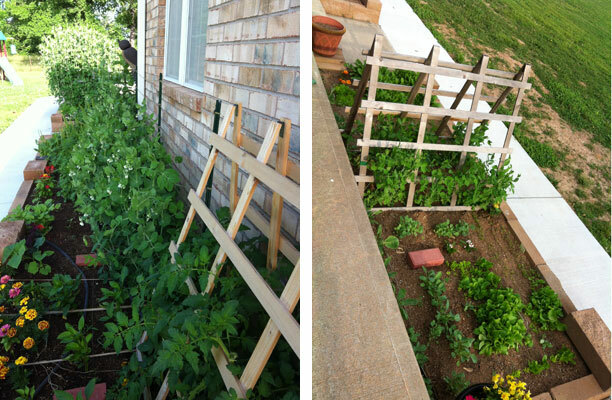 We’ve had our straw bale garden now for about three months. 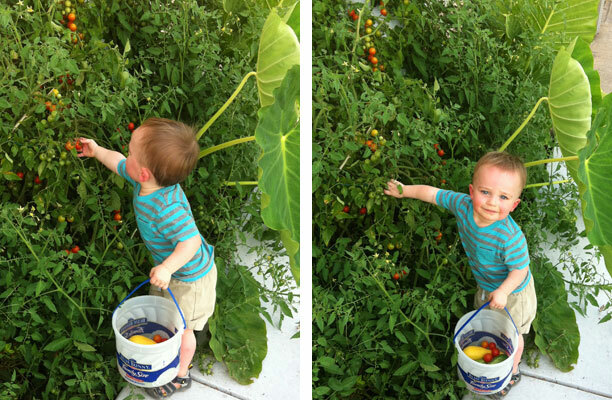 We have found that the tomatoes did not do well. Neither did the sweet peppers or the marigolds. 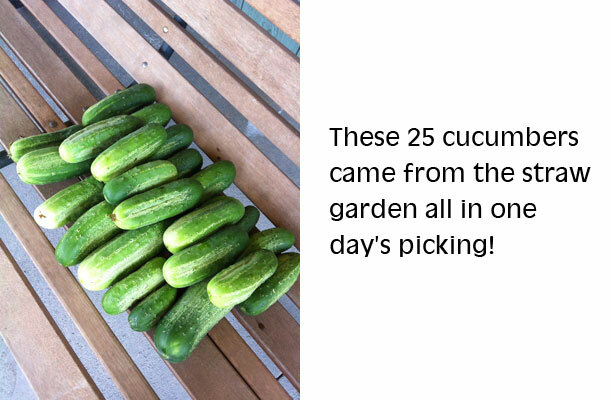 The cucumbers went CRAZY! Thus I’ve been making a lot of pickles this summer. :-) The sweet potatoes and the pumpkins have not harvested yet but they are growing nicely and I’m expecting good results. The straw is starting to disintegrate now and by winter, it’ll probably just be a nice organic heap for the compost pile. Hubs is already talking about doing several more next year. It’s such a novelty and makes interesting conversation among other gardeners. 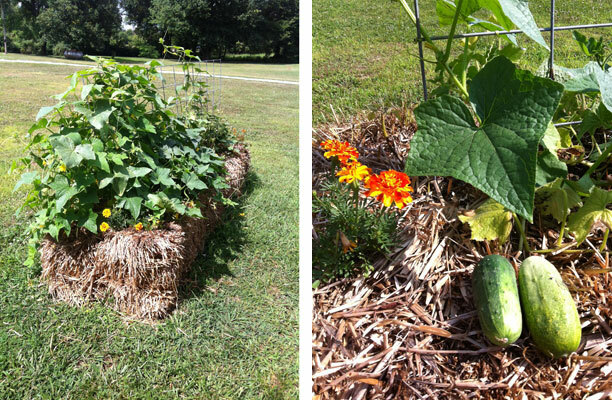 We’ve enjoyed our raised bed gardens and our straw bale garden so much this year. It’s been fun to experience the principle of sowing and reaping that God established in our world. I’ve often thought of the scripture that says: To everything there is a season, and a time for every purpose under heaven. There’s a lot to be learned from the garden if a person will just listen. I took a LOT of pictures during the growing and the harvesting. I won’t bore you with all of them but I’m going to post some of my favorites below. Some of them may or may not have grandchildren pictured also. 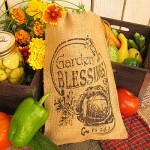 By the way, did you notice the cute “Garden Blessings” burlap bag? 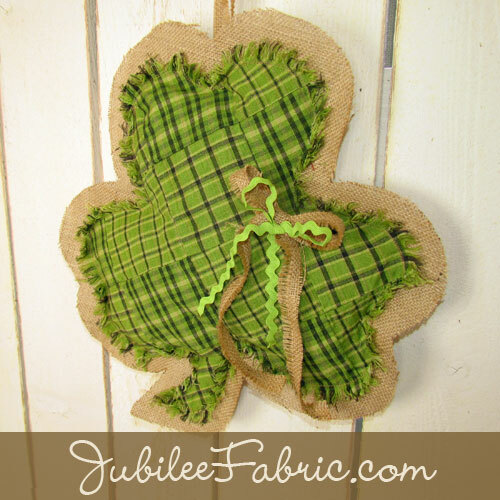 This is a product we sell in the JubileeFabric.com store. 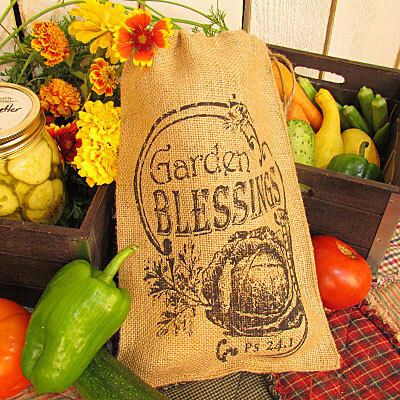 With any purchase of $15 or more from Jubilee Fabric, you can get a free Garden Blessings bag using this coupon code: blessings. Offer ends Sept 30. 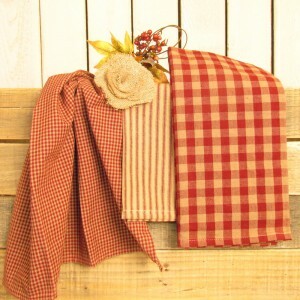 Love Those Homespun Kitchen Towels! I was so excited to see our new Homespun Kitchen Towels in the studio this week! I just love these soft, classic woven towels. Not only do they look great in your kitchen but they can be the basis for some fun and easy handmade craft ideas as well. 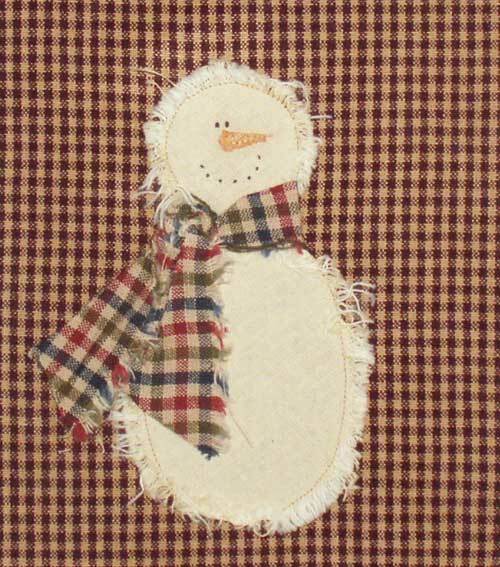 So as we are celebrating “Christmas in July” this month, I thought I’d pull out some of my favorite holiday towel craft project pics and share them with you. 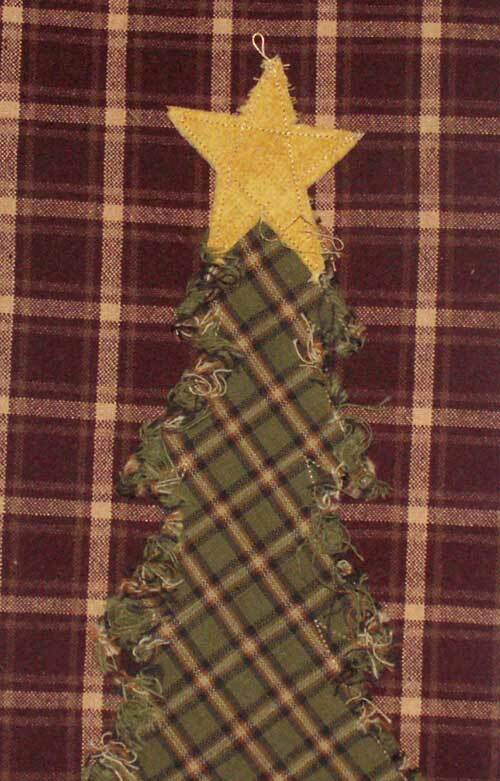 One super quick and easy holiday craft is to applique some Christmas shapes onto the towels using the frayed edge technique. 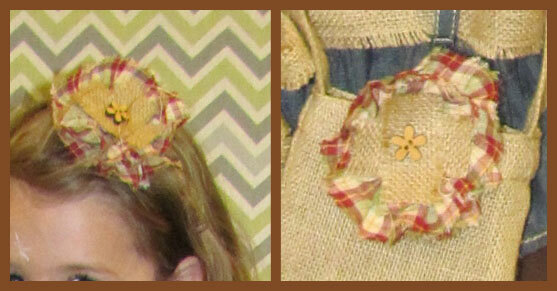 Just leave the raw edges of the appliques exposed and make a few little clips into the loose seam allowance. 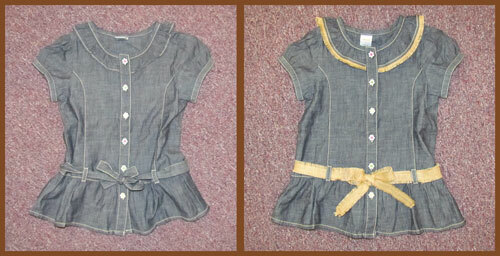 Add buttons, bows or fabric patches to embellish. 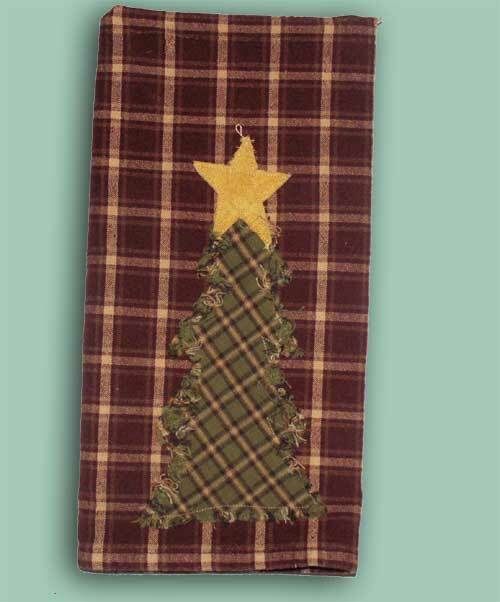 Then machine wash/dry your appliqued towel and the holiday design will come out all frayed and shabby style. 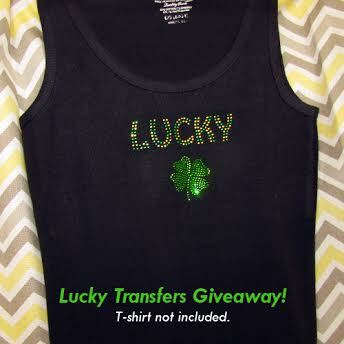 I’ve made these in the past to give as teacher gifts, hostess gifts and I’ve also sold many of them at craft shows. 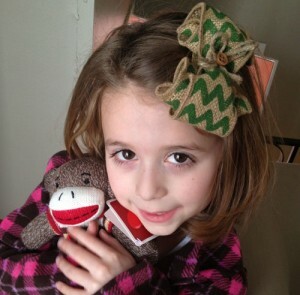 Do these towel projects inspire any good ideas for you? 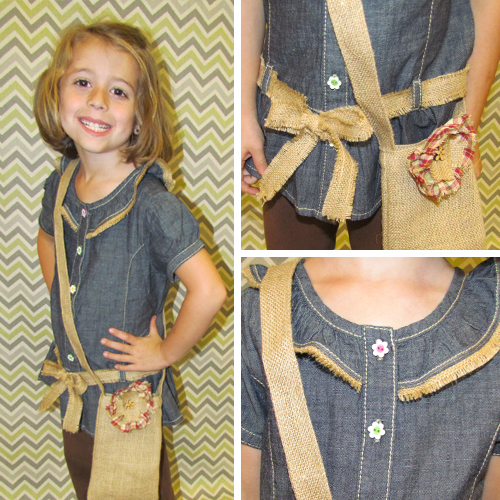 What craft would you do with a homespun kitchen towel? I’m sure I’ll be doing up some new ones too now that we have a fresh stash of homespun towels on hand. 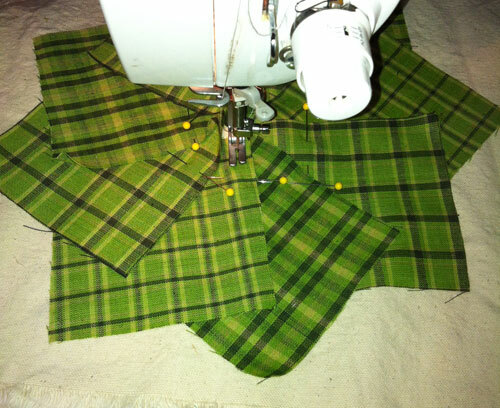 One of our customers, Michael E., recently sent us some pics of his rag style quilting projects. We featured a couple of those in our last post and I was so inspired by his creativity that I decided to do a similar wall hanging design with a simple tutorial. A big shout out to Michael for letting me be a “copy cat” and do something similar! 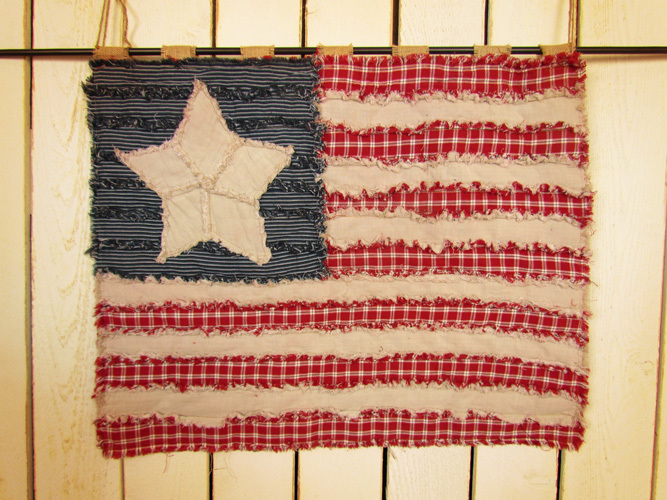 So here’s my version of the Americana Ragged Style Wall Hanging. 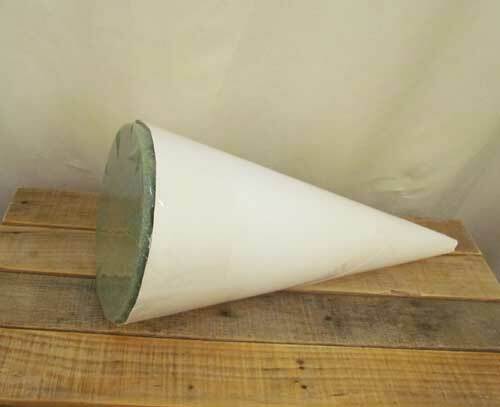 This project is easily adapted to any size that you want. 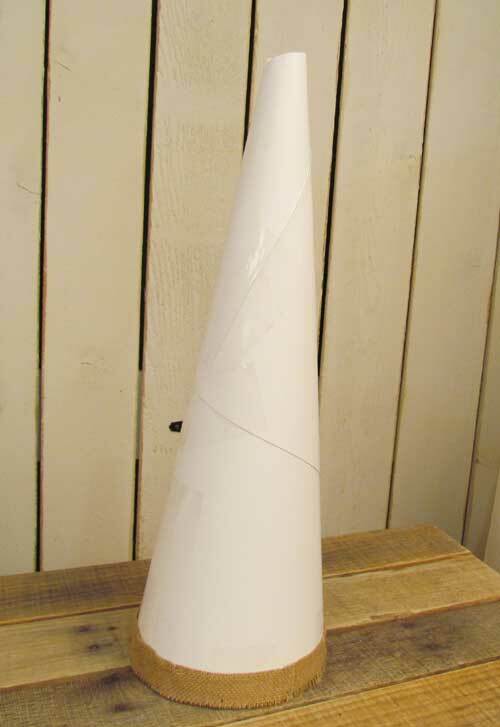 Mine ended up being about 30″ x 24″. The fabric yardages listed are estimates but if you have left over fabric, you can always create some coordinating “accessories” like I’ll show you at the end of the tutorial. 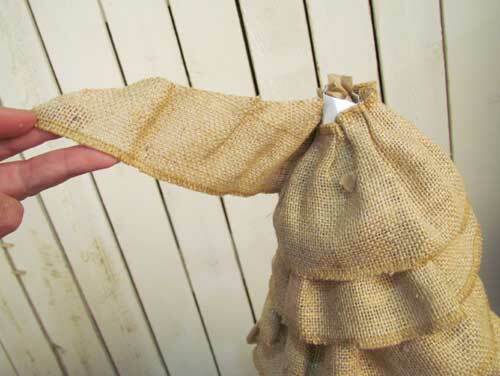 *Homespun fabric is highly recommended. 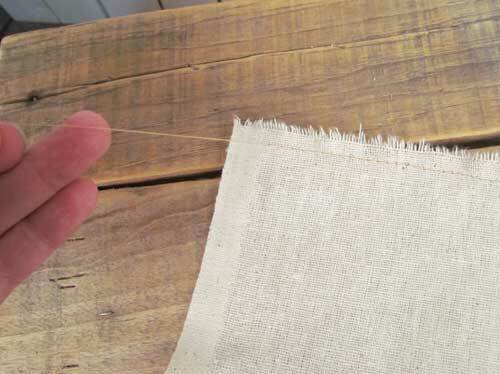 It is the only fabric that will fray as shown in the pictures. 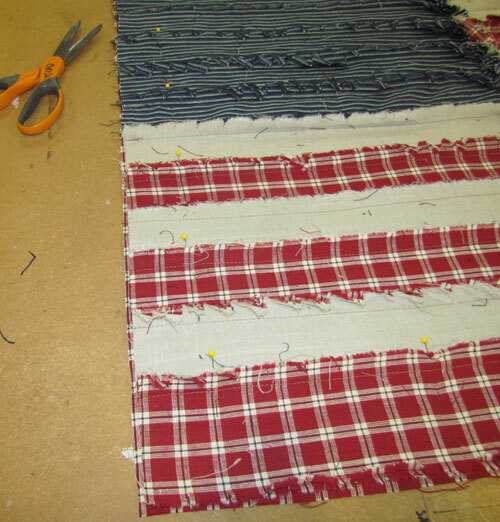 For this project, all your fabric stripes on the front of the flag will be two layers thick. This will help make your frayed seams fluffier. 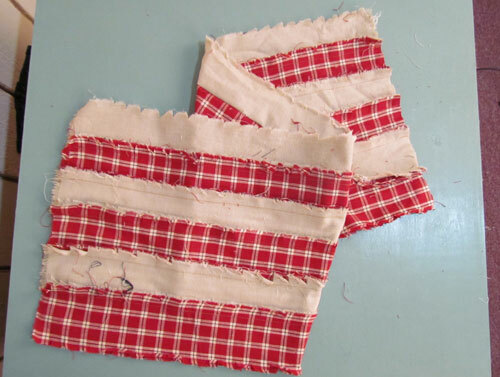 So when the directions say to stitch a white strip to a red strip, keep in mind that each strip needs to be two layers thick. All seams will be 5/8″ unless otherwise noted. 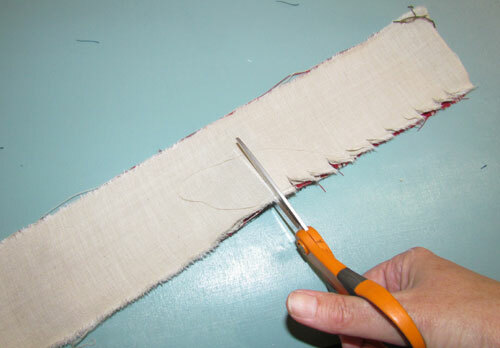 Do all your “tie down” stitching at the beginning and ending of each seam about 5/8″ away from the edge. 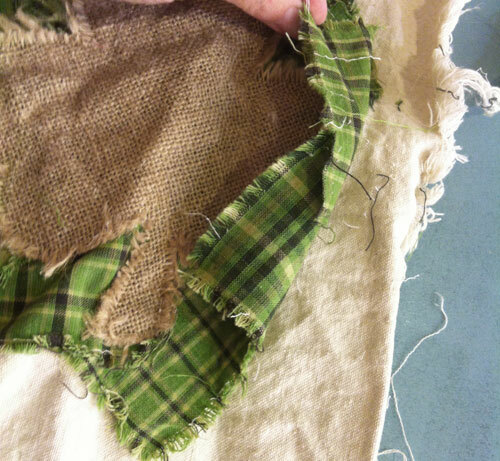 This is because the last 5/8″ of all seams will become fray when it is washed. 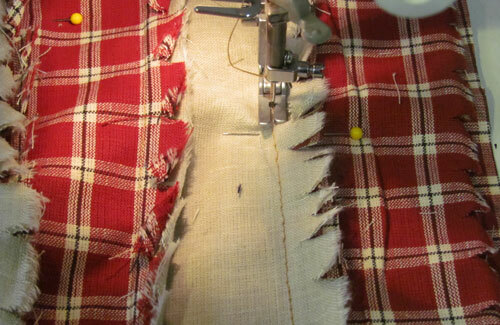 As with all rag stitching, lighten the pressure of the presser foot if your machine allows that or stitch with a walking foot. 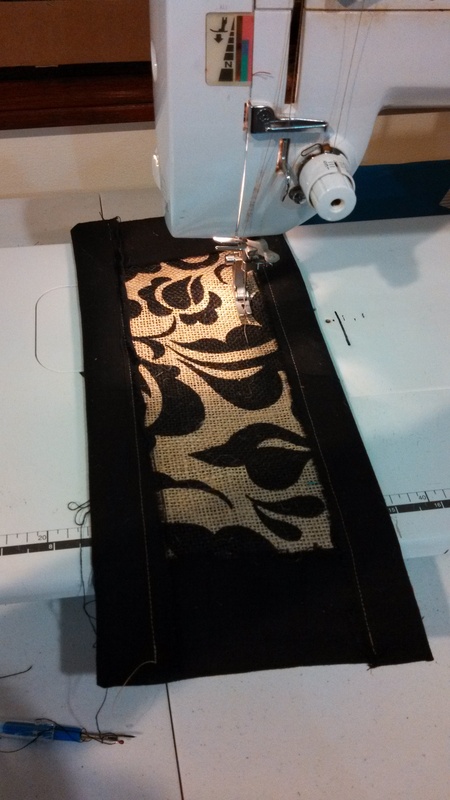 If you don’t have either of these options, just pin very closely so that the fabric won’t slide while stitching. All your raw seam allowances are going to have to be clipped at some point. Most of the time, I prefer to clip at the end but in this case, I found it very easy to clip the long strips before I started sewing. You may either do as I did in these pics and clip now or you can clip at the end if you’re more comfortable with that. I found that I could clips several layers at once this by clipping now. 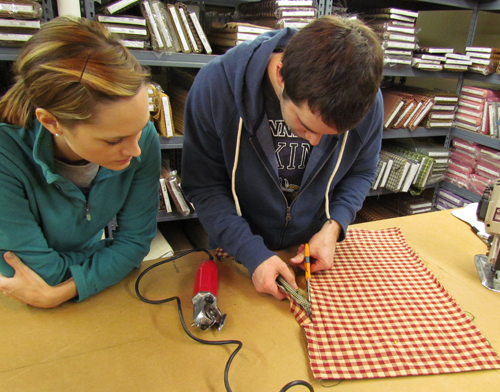 To “clip” the seam allowances, you’ll want to make small clips in the raw edges about 1/2″ deep and about 1/2″ apart. Don’t clip the short ends yet. You may be trimming those. Stitch the 6 long strips of red and 6 long strips of ecru together lengthwise, alternating colors. 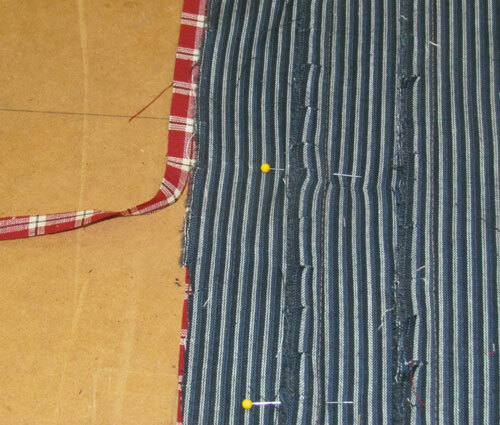 Each strip will be doubled so you’ll have three red and three ecru stripes when finished as shown in the image. 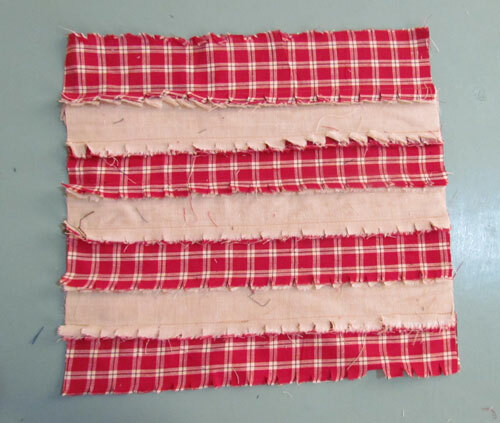 Stitch the 8 remaining red strips and the 6 remaining ecru strips together in the same way. Stitch the 14 blue strips together just like the other sets. 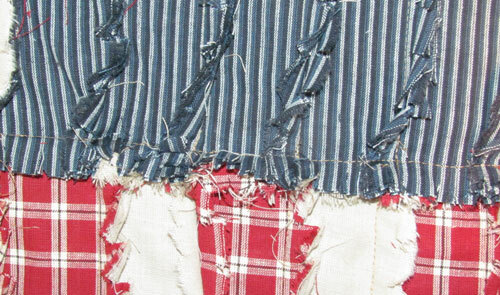 Now stitch the blue strips to the shorter red strips matching up the seams. Lay the seam allowances all in one direction. 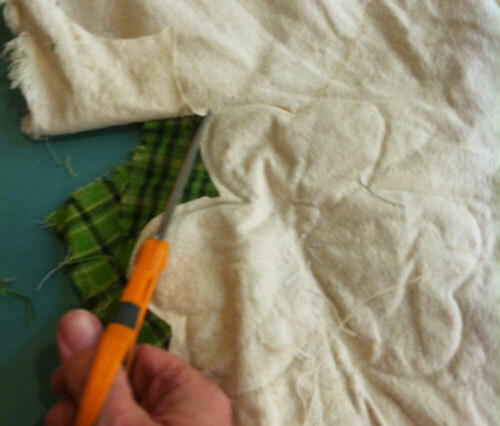 Clip the seam allowance loose after stitching so that the seam allowances are free and not stitched down. The upper part of the flag base is complete. Now stitch this to the long red strips keeping the blue portion on the upper left. 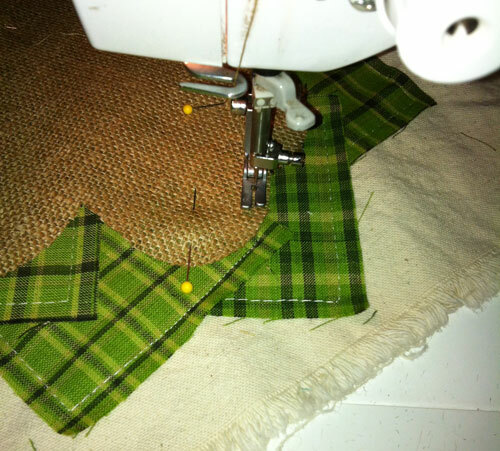 Press the flag out flat and preferable keep all seams folding in one direction. At this time, you may realize that some of the strips have ended up being a bit longer than the others. 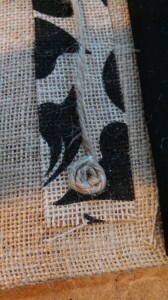 That’s fine… “close enough is good enough” in rag stitching. 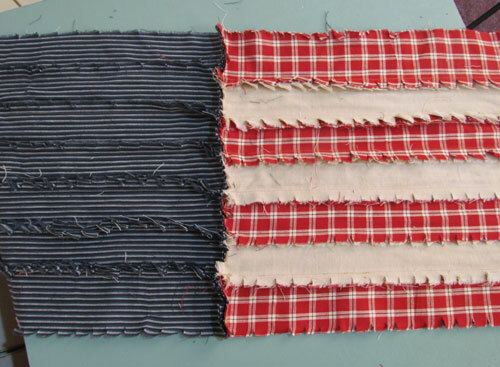 To remedy this, just trim your flag base slightly on both right and left sides so that all the strips line up nicely. 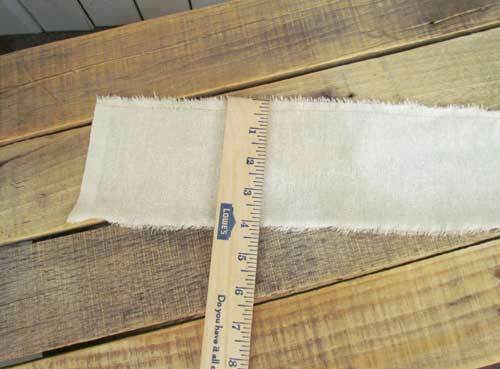 Use a yard stick to draw a line if needed and make sure that the length of the top edge is still the same as the length of the bottom edge after trimming. 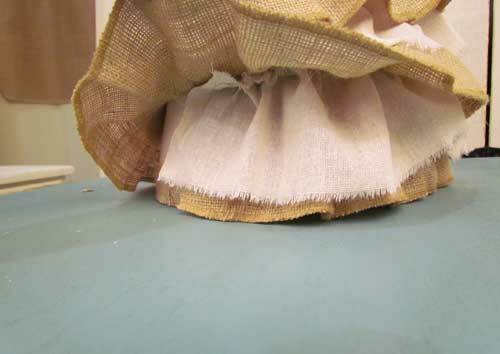 Place the batting material on the pressed flag on the side WITHOUT the seam allowances. The seam allowances of the flag should be facing your table, away from the batting. 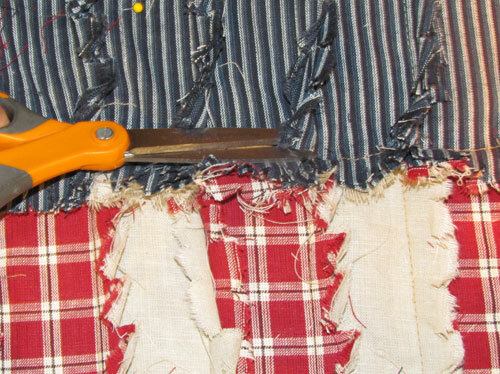 Trim the batting so that it is at least 1.5 inches smaller than the flag on all sides. 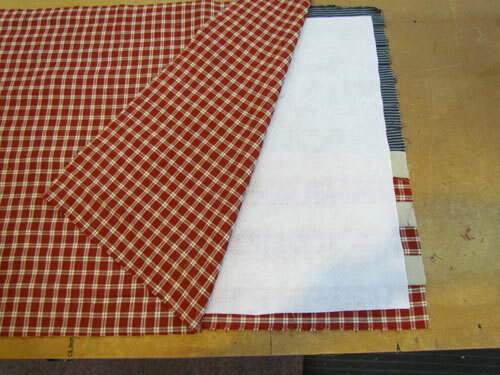 Place the red backing material on top of the batting to form a “sandwich” with the batting in the middle. 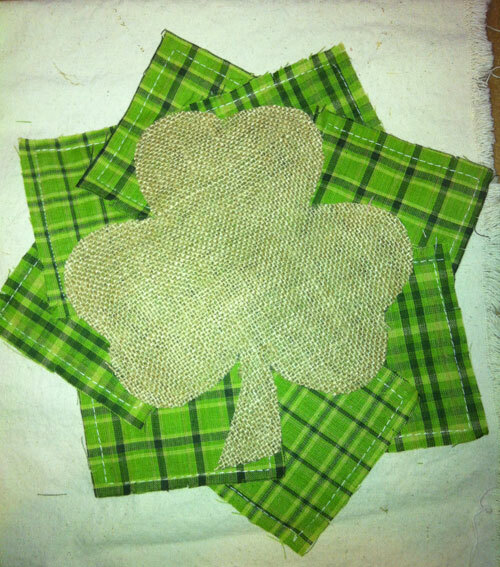 Pin the edges to hold it all in place and flip it over so that the flag is on top with the seam allowances up. Now trim the backing to fit the size of the flag if needed. 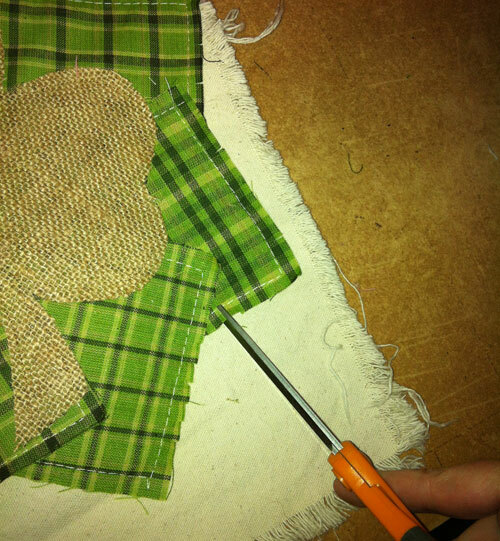 Pin frequently along all the outer edges and the seams. 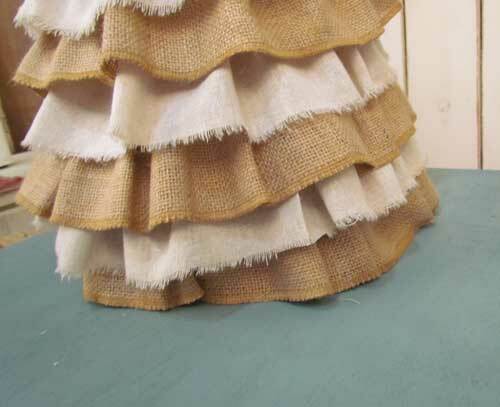 Stitch on top of the long stripe seams through all the thicknesses. 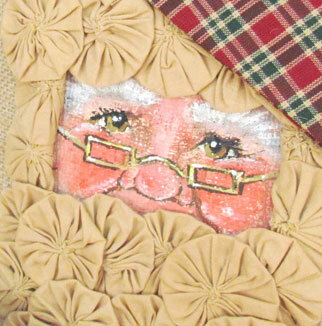 This will “quilt” the wall hanging. A walking foot on your machine can be helpful here. If you don’t have one, just life the presser foot occasionally to ease the top layer of fabric in. If you have occasional tucks and puckers, don’t worry over it. 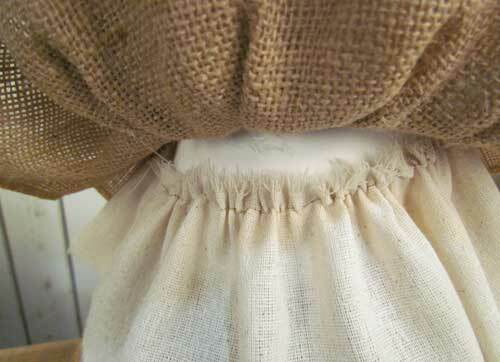 The fray will fluff out over those seams and hide many flaws! 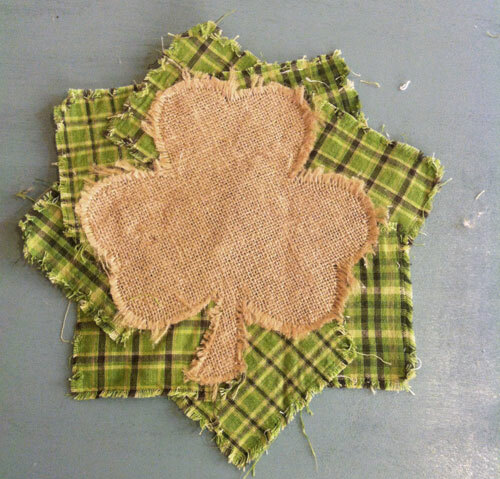 “Close enough is good enough” in rag stitching! Now stitch your star together. The star has one point at the top, two points on the sides and two points on the bottom. The pattern pieces are marked accordingly but they are very similar in size so if you get them mixed up, it really won’t be very noticeable. 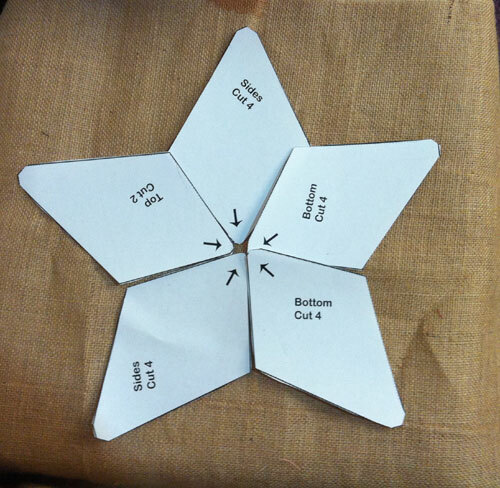 The pic below shows how the star pieces lay out. 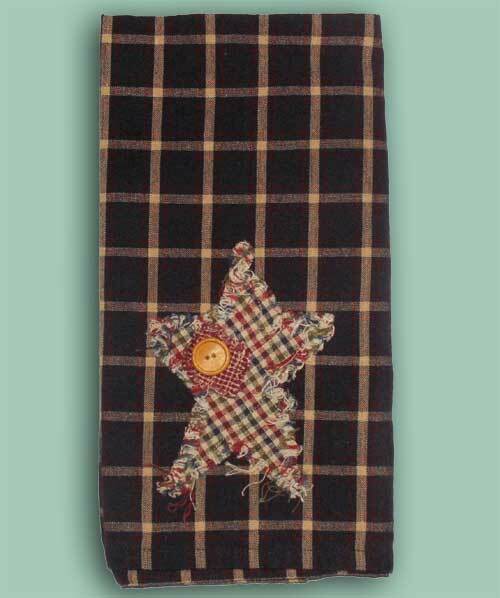 The short sides are the ones that stitch together, the long sides are the points that extend and the arrows show you which end goes to the center of the star. 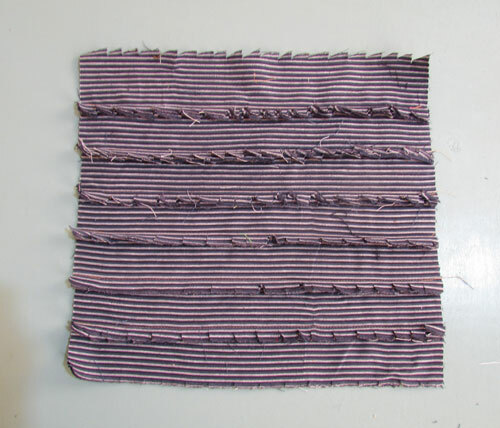 Just like the stripes, the star pieces will also be two layers thick. 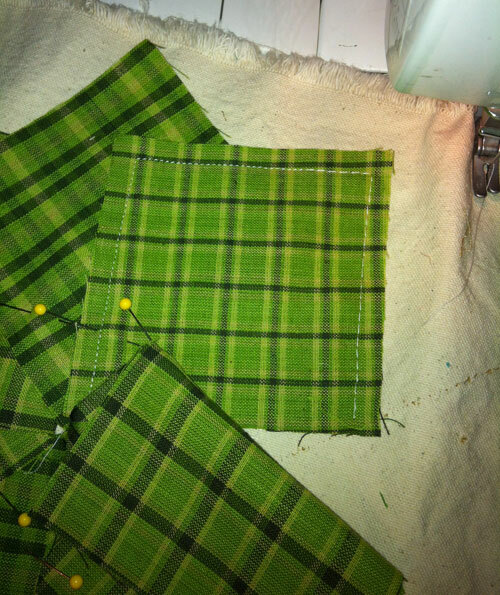 Your seam allowances on the star will be 1/2″. 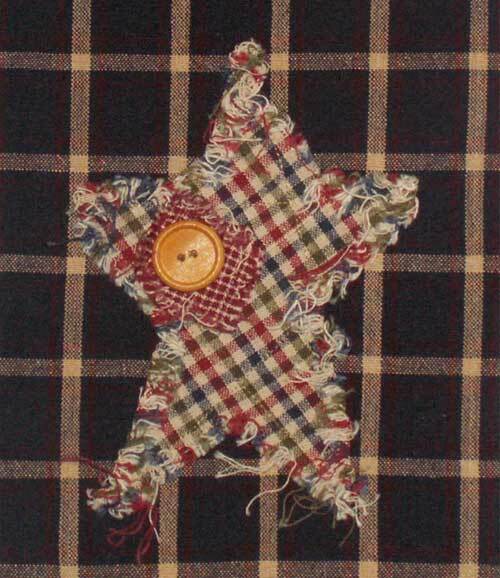 The small star on the pattern pieces shows you which end goes to the center of the stars. The other end of the point is on the outer part. 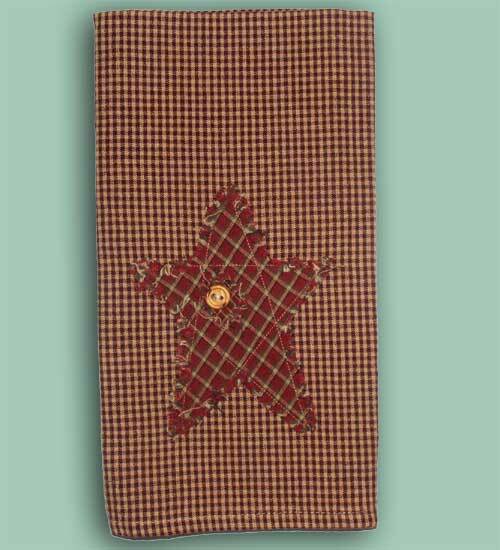 Press the star flat after stitching. 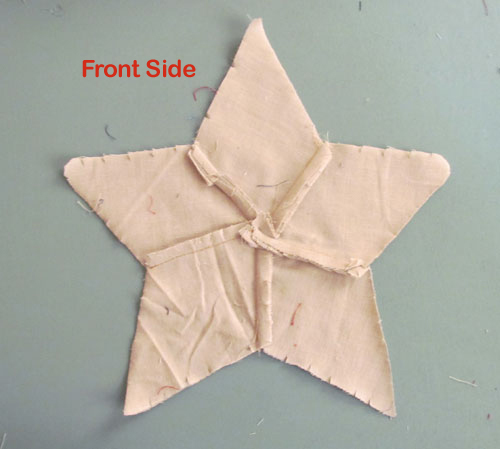 The “front side” of the star is the side with the seam allowances. 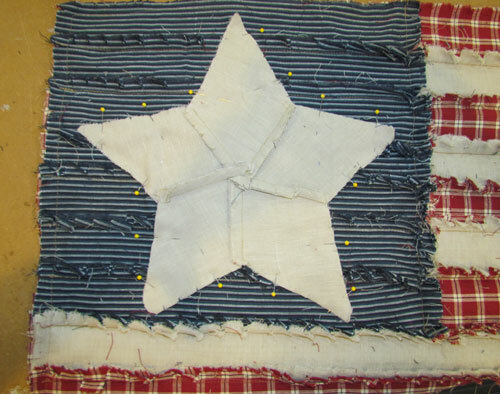 Pin the star onto the center of the blue stripe portion of your flag. 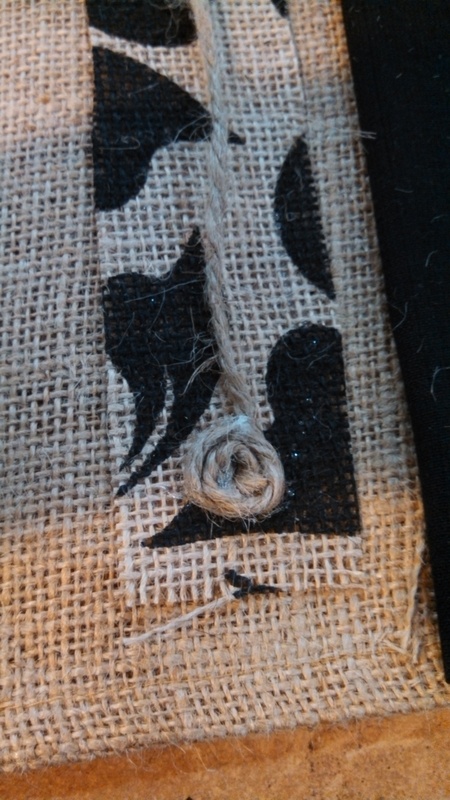 Stitch about 1/2″ from the outer edges. 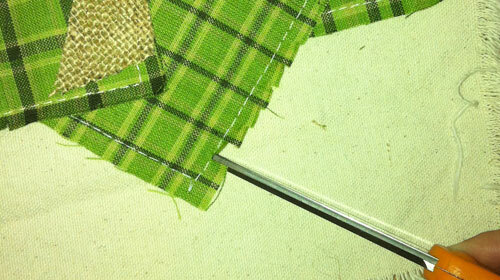 Stitch around the entire perimeter of the entire flag about 5/8″ from the raw edge. I call this a victory lap because it always seems to be the last sewing step! Clip any raw edges that you haven’t clipped already. If you didn’t clip in the first step, you’ll have a lot to clip now. 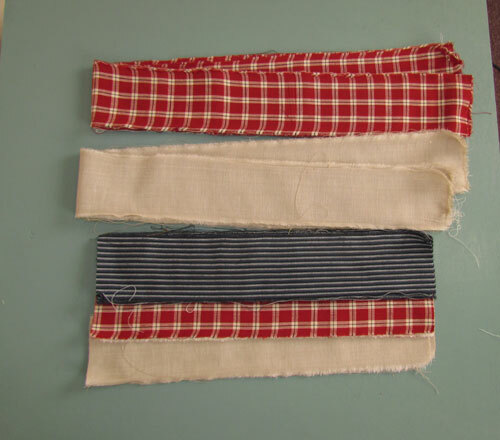 If you did clip in the first step, you’ll need to clip the right and left sides, the backing, the star and the seam between the blue and the red/white stripes. 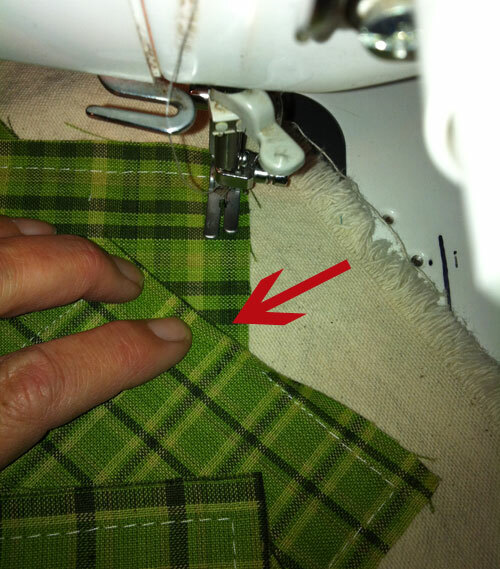 Be very careful that you don’t clip through any stitching when making your clips. Wash your flag hanging in a washing machine. I recommend using a high water level even for this one item so that you’ll have minimal color bleed from the red fabric. 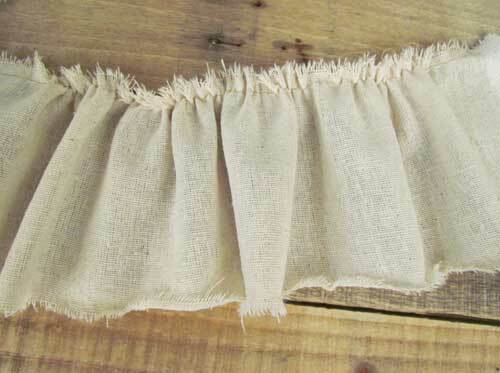 I also recommend using about 1/4-1/2 cup of table salt in the wash water to help set the fabric dye. 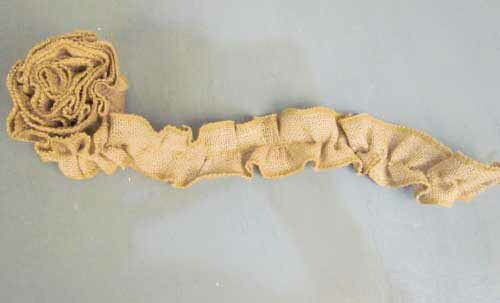 Liquid fabric softener will help loosen the strings but it’s not required. After washing, take the flag outside and shake loose the remaining strings before you put it in the dryer. Tumble dry and then shake loose even more strings! You’ll also want to stop the dryer at least once or twice and clean the lint screen. After washing and drying, check to make sure your flag is hanging fairly straight. You can gently stretch any short sides if necessary. You can also wet it again and lay it out flat and square to dry. Press from the back side if any ironing is needed. 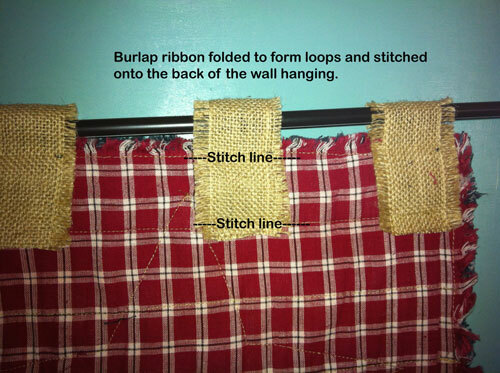 Cut seven pieces of the burlap ribbon (6.5″ – 7″ long) and stitch them onto the back side of the flag to make some loops for hanging. These I applied after the washing and drying was done. 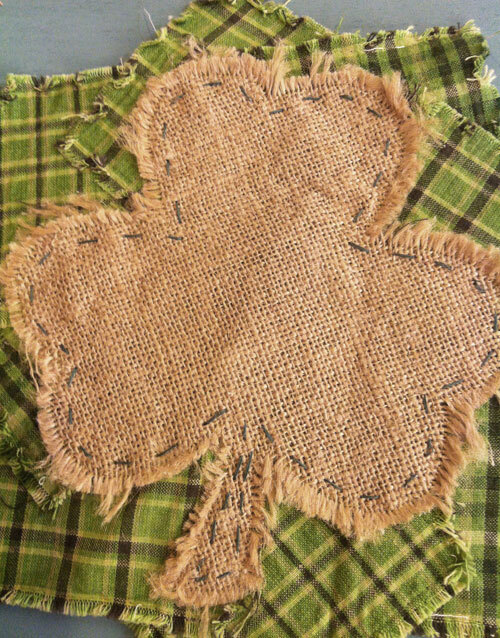 I just stitched through all thicknesses (flag and burlap). 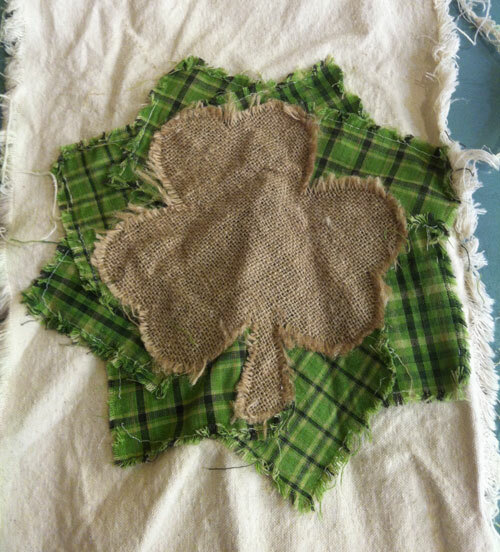 I made the loops long enough that I could stitch them twice, once following the the first seam of the flag and then again following the second seam. 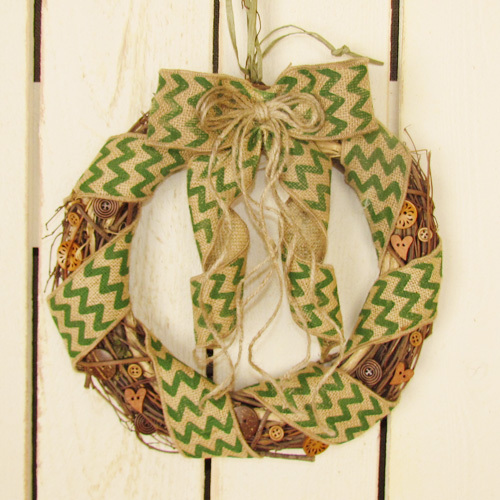 I think there are many ways you could find to hang this wall hanging or you could display it on a table or coffee table as is without any loops. 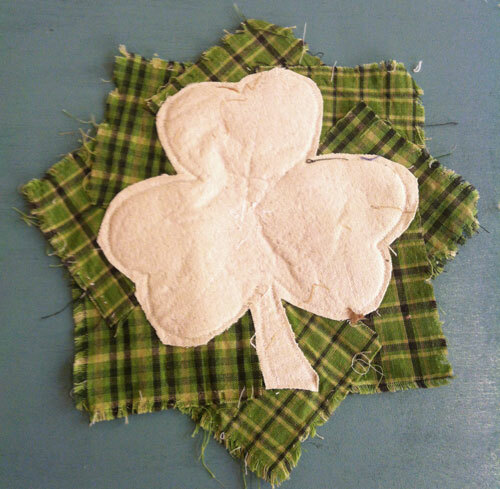 When you are rag stitching, scraps are never just scraps… they are pieces of fabric begging to become a coordinating accessory! 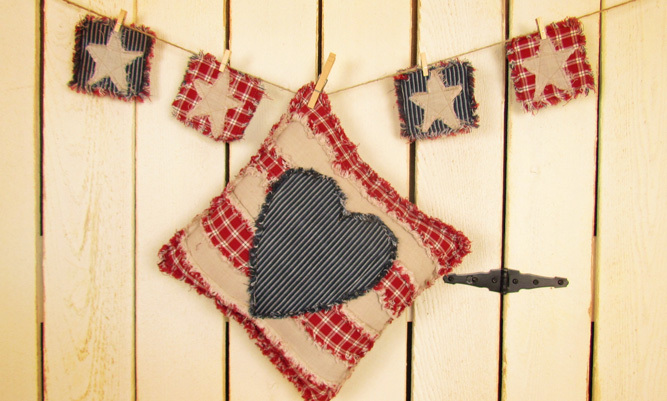 These are a couple of goodies, a cute Americana heart pillow and some Americana star quilted coasters, that I made with my left over fabric from this project. They will look great with my wall hanging and decorate my house so nicely for Memorial Day and then again on Independence Day. 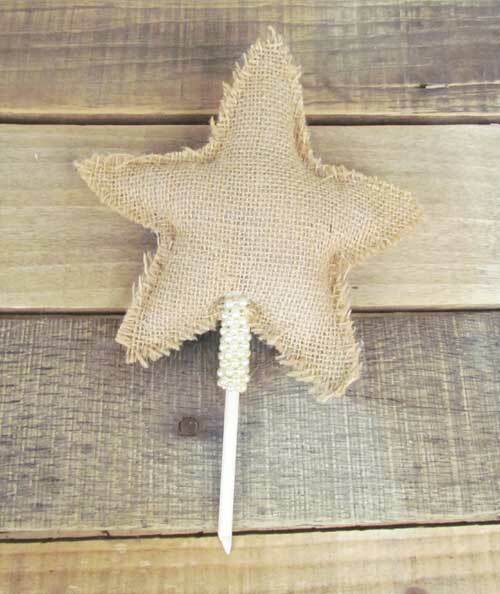 The star coasters can even embellish a decorative banner for the wall. 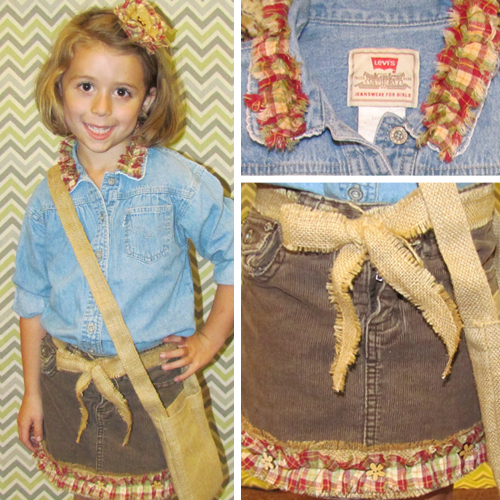 Oh, the things you can do with scraps and rags! 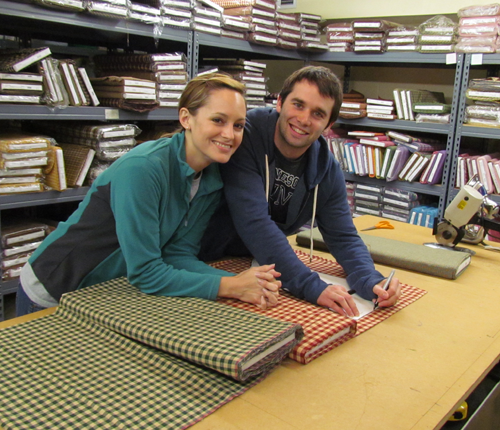 While the vast majority of our fabric customers are female, we do have a few occasional guy customers. One of these guys recently surprised us with some pics of his recent projects. All I can say is… wow! Michael E.’s quilts were beautiful and creative! 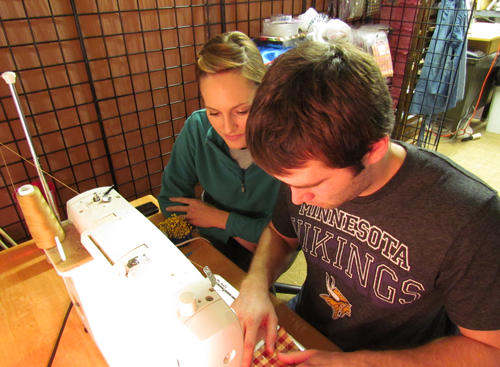 Michael tells us he is a beginner and is just learning to use the sewing machine that he’s had for over a year. 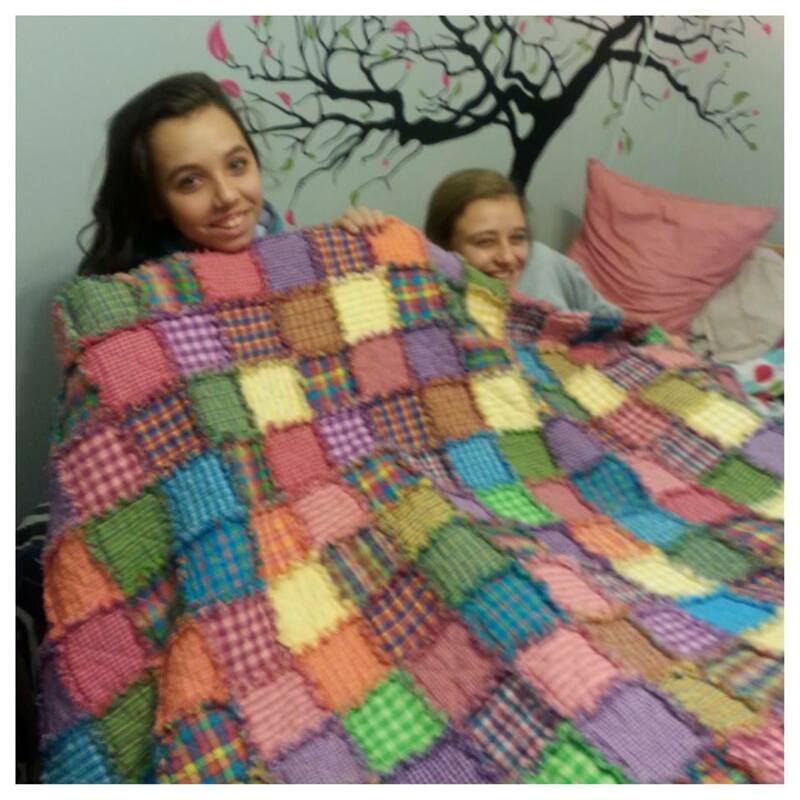 His first rag style quilt project was for his daughter and he did the quilt in our bright homespun fabrics. 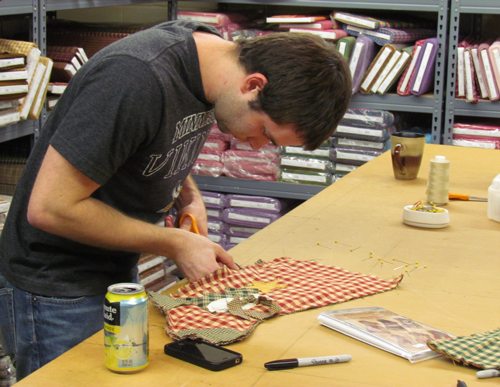 Now that Michael has demonstrated his sewing skills, he says his wife is thrilled to be lining up some “projects” for him! 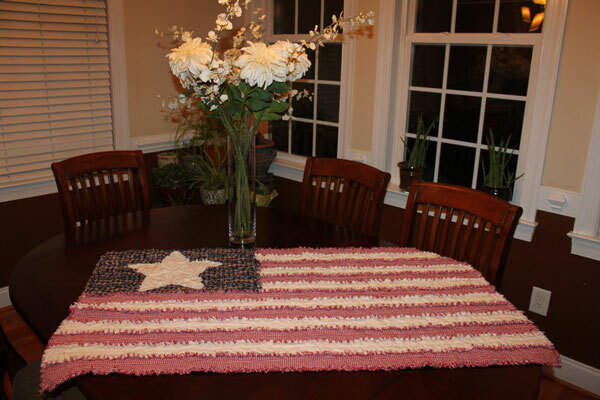 Michael recently sent us a pic of his most recent project, an American flag design! 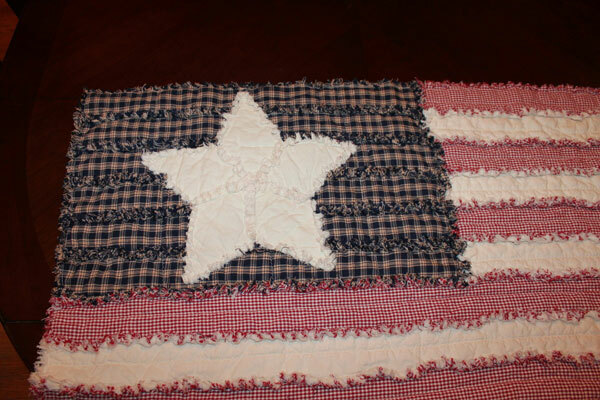 This quilt is absolutely beautiful and he used several of our red, white and blue homespun fabrics to create it with. This was his own design concept and he worked out the dimensions and pattern pieces using this link to the specifications of the American flag. I’m thinking that Michael shows a lot of promise as a quilt designer! Too bad it’s only his hobby and not a career but I’m sure he will enjoy designing quilts for years to come. 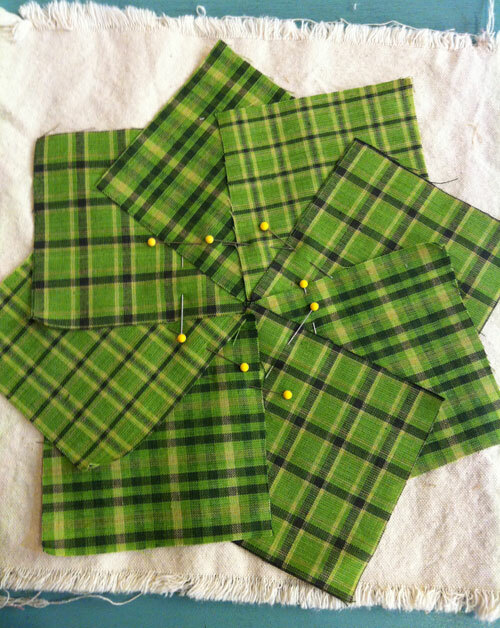 Rag quilting can be quite addictive! This American Flag quilt has inspired me to create a similar wall hanging. 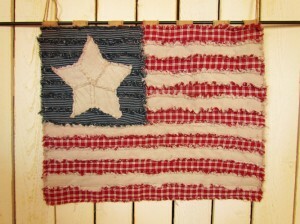 I’ll be posting a basic tutorial for that soon along with a few other “stars ‘n’ stripes” inspired accessories. Although it’s not quite as ambitious as designing and creating your own quilt, my nephew-in-law, Bryan, did a bit of sewing not too long ago. 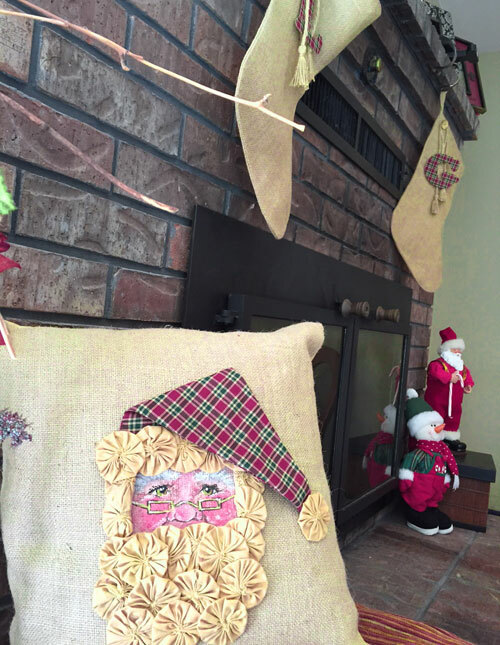 He and my niece, Amanda, were celebrating their first Christmas together and they wanted to create their own Christmas stocking using our ragged style stocking pattern and homespun fabrics. 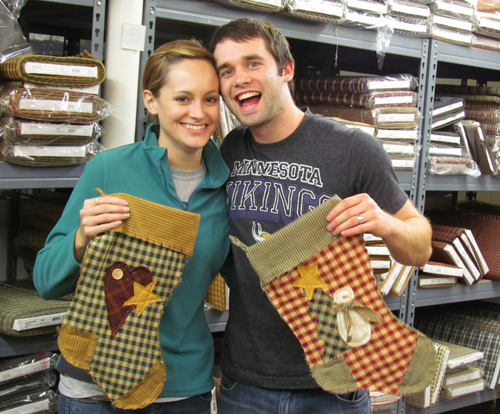 Bryan and Amanda each picked out their own stocking style and the fabrics they wanted to use. 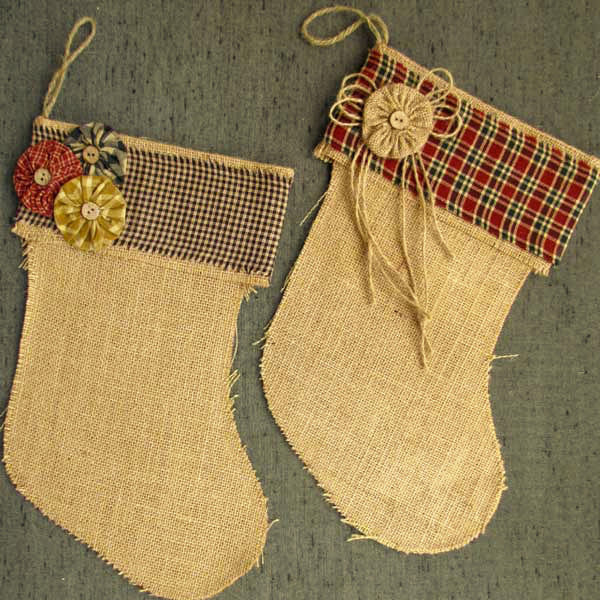 They were both beginners on the sewing machine but they both managed to stitch up their own stocking very nicely. 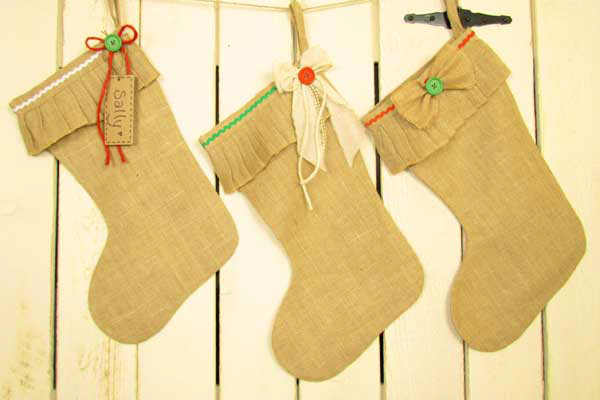 The results were great and Bryan and Amanda will have these handmade stocking heirlooms for years to come. So I’m inclined to think that many of our guys are more creative than they are letting on! 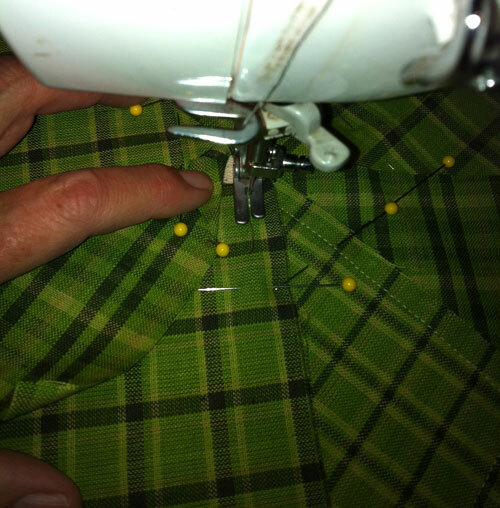 Do you know a guy who sews? I’d love to teach a “for guys only” sewing session some day. I bet that would result in some really creative projects! Looking for a creative way to display pictures for events such as wedding showers, graduations, etc? Perhaps you would like to spice up your home with a creative display of family pictures. 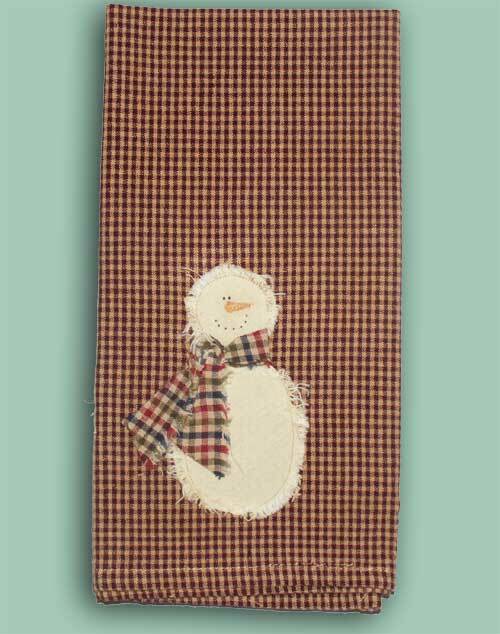 This wall hanging project can be decorated any way you like to fit your occasion or home theme. I will be describing how I made my couple-themed wall hanging. 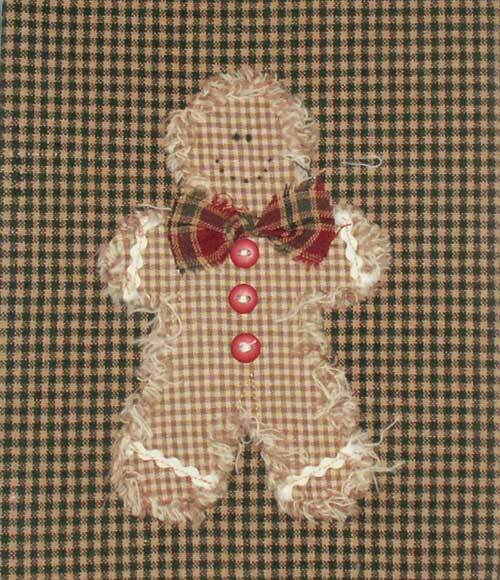 This wall hanging would be a great decorative addition at a wedding shower! 1. 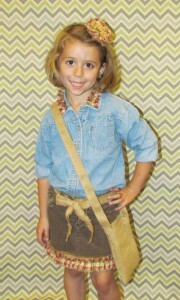 Prepare your wall hanging backdrop: For this project, I used a burlap table runner with lace for the backdrop. I cut the runner directly in half and folded the raw edge 3 inches over. I then sewed across to make a hole large enough to slide a rod through. The hole size can be adjusted accordingly. 2. Design your header: I started the decorating process by creating my header. I cut out a 6″ x 10″ piece of Milano Damask printed burlap and tore an 8.5″ x 18″ piece of black solid homespun fabric out of a fat quarter. 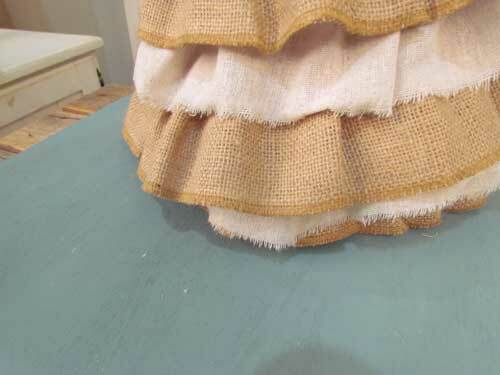 I placed the printed burlap in the middle of the fabric and folded the sides of the fabric over to touch the edges of the burlap. (This should make the width the same width of the runner at 14″). 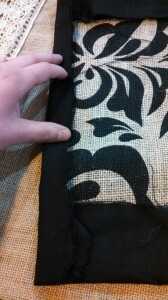 Then I folded the top and bottom flaps over the printed burlap and sewed to attach them together. 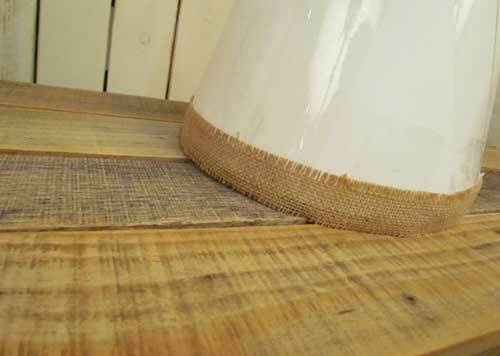 That secured the sides and created a frame around the printed burlap. 3. 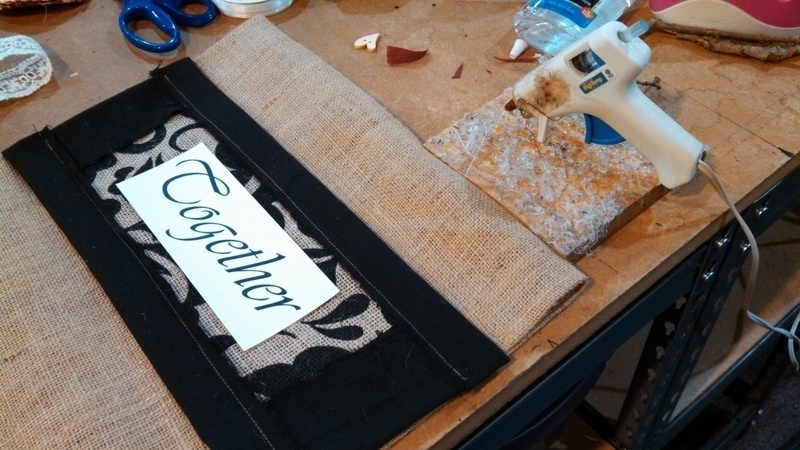 Make a title for your header: For my theme, I printed the word “Together” on a piece of card stock and glued the word into the center of the framed printed burlap header. 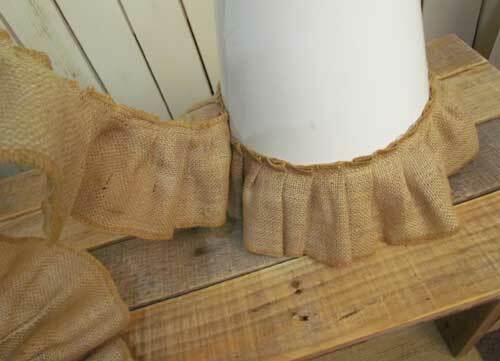 I then glued the entire header onto the burlap runner adjacent to the seam for the rod. 4. Find a layout for your pictures: I laid out the pictures to find a layout that worked well. 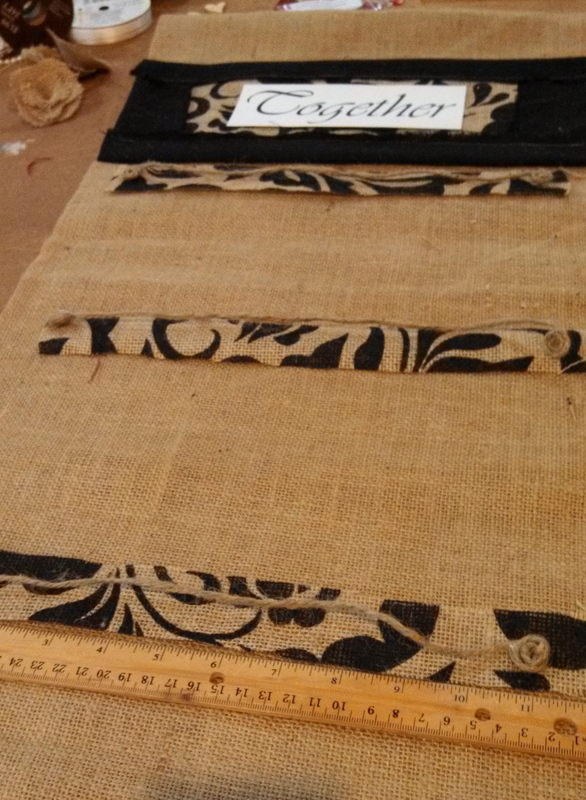 Once I knew where the pictures were going, I cut out 1.5″ x 12″ strips of the printed damask burlap. I glued the strips just above where I wanted my pictures to hang. 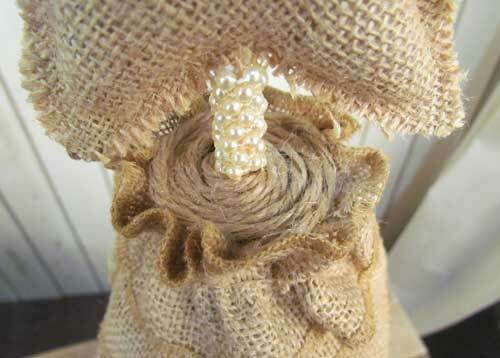 Once the strips were glued in place, I cut segments of jute twine that were a little longer than the 12″ printed burlap strips. 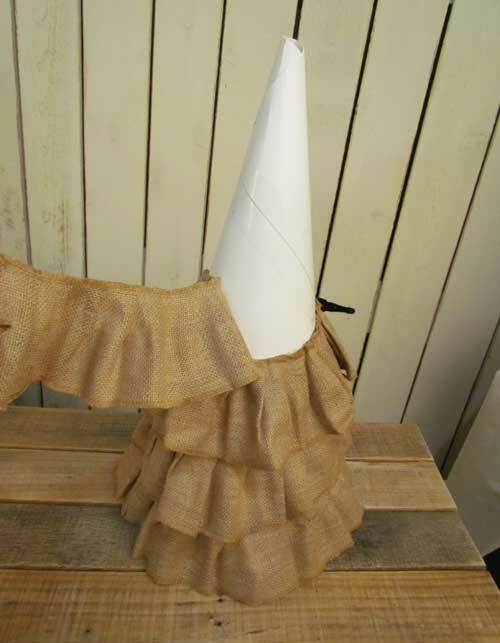 I rolled the ends of the twine to make a small pinwheel and glued the pinwheels to keep them from unraveling. 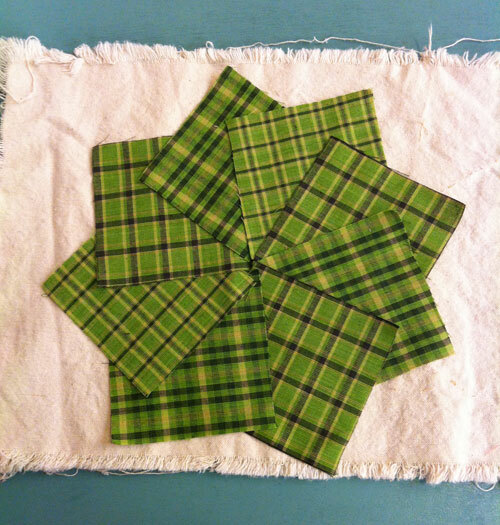 Then I glued the pinwheels on the edges of the strips so that the twine lay across the middle of the strips. I did this three times until I had created the correct amount of lines for my chosen pictures to hang on. 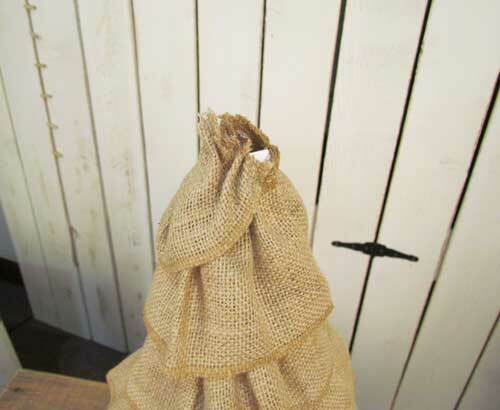 Using mini clothespins, I pinned the pictures on the twine. 5. 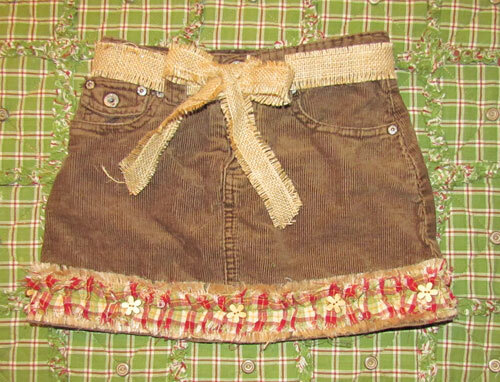 Add embellishments. I glued 3 whimsy heart buttons to either side of the header. The last embellishments I added were printed on card stock and mounted just above the lace at the bottom of the runner and to the sides of my middle picture. 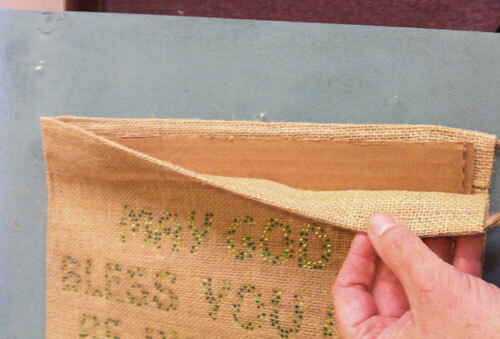 I glued the words directly to the burlap runner. 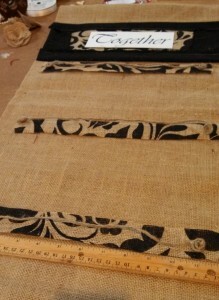 The sentence, which I framed with black solid fabric, was also glued to the burlap runner. 6. Add extra support (if needed). For more support to keep the wall hanging from bending inward, I glued 3 strips of sturdy cardboard to the back of the runner. I also have created this family-themed wall hanging. Sticks were used to give the hanging more of a rustic feeling. 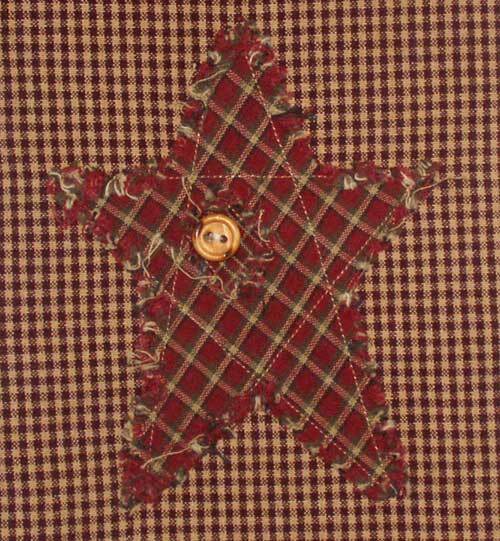 The materials used for this wall hanging were Sassafras red homespun fabric, red chevron burlap ribbon (which was cut down the middle), assorted fabric yoyos, various buttons, and Kraft Scripture tags.